Below you’ll find the canonical reference for Cinco de Mayo email planning. From email examples to specific promotional strategies, we’ve included everything you need to ace your campaign. Whenever Cinco de Mayo rolls around, inboxes overflow with brilliant colors, piñatas, sombreros and maracas. It all starts to run together. Want to stand out? 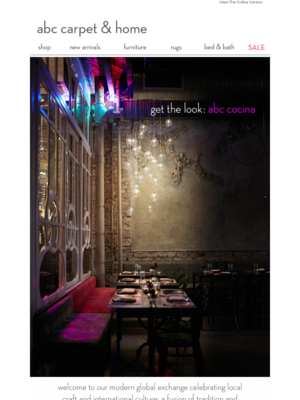 Go dark and elegant, like this email from the high-end home furnishings dealer promoting its new Mexican restaurant. If your brand is one that isn’t usually associated with Cinco de Mayo, look for ways to align with the holiday while avoiding clichés. This email walks pretty close to the line for taste (see Strategy No. 1 below) but we can’t hate it. The last line, “K Gracias Bye,” even made us laugh with its play on “KTHXBYE.” The design combines fonts so well that it doesn’t really need images. This image-free design shows off the calls to action, and the animated letters compel the viewer to continue scrolling to the bottom. 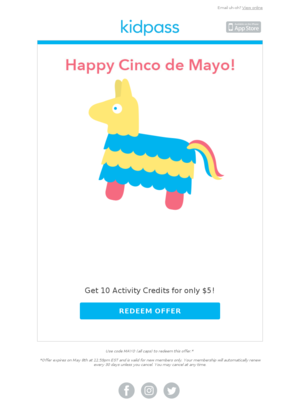 The piñata theme is common for Cinco de Mayo emails, but you can rise above the pack by making it deliver your offer, as this Kidpass email shows. 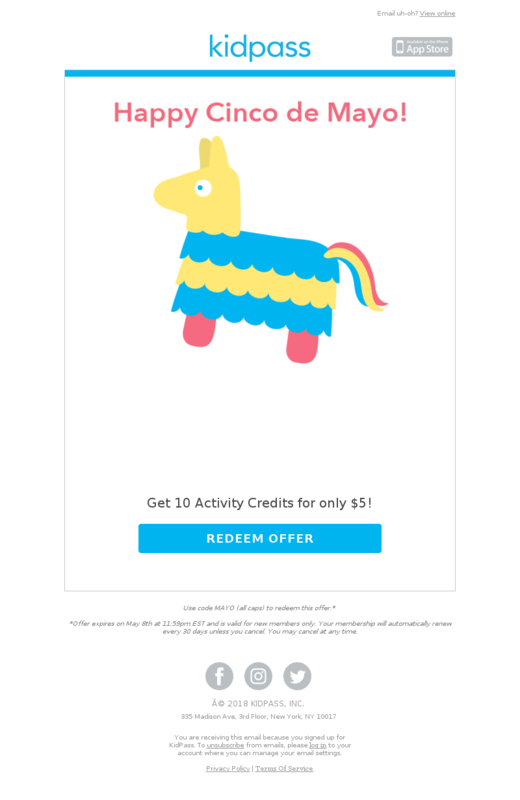 We like the color scheme — bright but in keeping with the brand’s official color palette — and the way the animated piñata bursts open so that the offer falls right on top of the call to action. It’s simple and effective. If your customers are all about the food of Cinco de Mayo, you can have some edible fun with the idea. 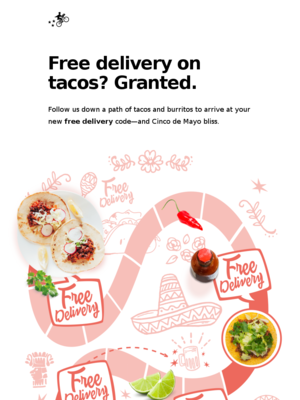 That’s what Postmates does with this email, which looks like a grown-up version of the kids’ game Chutes and Ladders. But it’s an effective ploy because it take the email reader all the way down to the offer — the easy-to-remember code guacnroll. A thoughtful rendition saves this email from repeating the usual clichés about margaritas and fiestas. A fiery color palette and recipe for a high-end margarita will appeal to Bloomie’s younger, status-conscious shoppers. Also, note the absence of an offer or any kind of promo other than the navigation tab. As a high-frequency emailer, Bloomingdale’s can afford to take one email out of its stream and make it memorable. 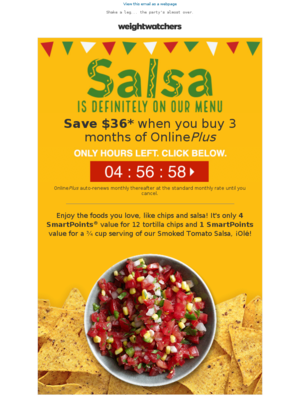 We picked this email because it ties the party in to a major concern for its subscribers by showing how many points a serving of chips and salsa would be for WW users on its plan. We also liked the bold color palette and the way the countdown clock timer stands out. 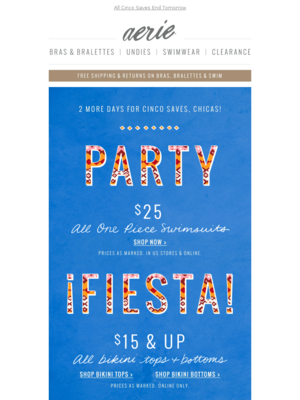 Start planning your Cinco de Mayo email strategy with great examples. This Chili’s Grill & Bar email calendar is based on Chili's Grill & Bar, who sent 1 emails for Cinco de Mayo in 2018. This Mo Hotta Mo Betta email calendar is based on Mo Hotta Mo Betta, who sent 2 emails for Cinco de Mayo in 2018. This Poncho 8 email calendar is based on Poncho 8, who sent 2 emails for Cinco de Mayo in 2018. Will you simply send one email on Cinco de Mayo or will you send a few emails leading up to it, including a “last chance” email once the event is over? Based on 335 emails mentioning "cinco", "drinko" in the subject line. Discover the most popular types of promotions used for Cinco de Mayo. Understand how steep a discount companies offer for Cinco de Mayo. You can toggle between Dollars Off and Percent Off. 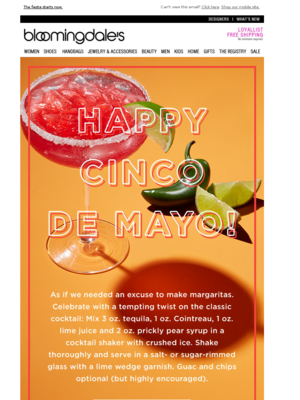 Ace your Cinco de Mayo email content with these ready-to-implement strategies. Enjoy! Cinco de Mayo (Spanish for the Fifth of May) celebrates the Mexican Army’s unexpected victory over the invading French Army on May 5, 1862. Aside from defeating what had been considered the best army in the world, Mexico’s victory prevented France from establishing a base it could use to aid the Confederate Army during the U.S. Civil War. Since then, Cinco de Mayo has evolved into an annual celebration of Mexican culture. Below you’ll find three strategies worth keeping in mind when planning your campaigns. Tacos, tequila, sarapes, sombreros, maracas and margaritas … These might say “Cinco de Mayo” to you, but chances are you aren’t Mexican, Hispanic or Latino. Co-opting a Mexican day of celebration to promote your brand can be a tricky process. You want to have fun without offending your Mexican-American customers or getting vilified for cultural tone-deafness on social media. First, if the phrase “Cinco de Drinko” or any other Spanglish words appear anywhere in your email copy, take them out right now. No discussion there. Beyond that, proceed carefully. Feel free to use the bright colors associated with the Mexican flag (green, white and red) or with Mexican art (primary and red-based hues). Incorporate elements of Mexican culture that feel appropriate for your brand and products. Run any Spanish phrases past a third party (preferably a native speaker or someone who knows Mexican culture well enough to detect any accidentally offensive phrases). Finally, use the sniff test. If you find yourself reaching hard for a theme, it’s often better to move on. You don’t need to fall back on the inoffensive-but-ineffective “Take 20% off in honor of Cinco de Mayo.” Just imagine how it would look if someone who doesn’t share your own cultural heritage were to use caricatures of it to sell shoes. As we note above, color is a major element of Mexican art and culture. The Cinco de Mayo emails we showcase above are drenched in vivid colors. A colorful palette will help your emails stand out from your usual email stream. Another trend we notice among Cinco de Mayo emails — more imaginative use of animation than for other holidays. And not just one jiggling little icon either. We’ve seen lots of countdown clocks — appropriate given how short the email window is for Cinco messaging — plus animated hero images. For examples, click through to check out the emails we showcase at the top of the page.